It seems people have strived to capture photos in the quickest successions possible using the cheapest possible cameras since time immemorial. Perhaps I am exaggerating a bit but there is something in it. Single lens reflex cameras have shown several flaws during the development of the photography and we are going to focus on that market segment exactly. Putting a mirror in the main optical path of a camera had considerable consequences when it comes to its functionality. The parallax error became well forgotten and the viewfinder was able to present a real preview of the final photo, especially after inventing a mirror able to return automatically to its initial position. In the sixties of the 20th century through the lens metering system, the so-called TTL, took the market by storm, allowing to measure the light only in the frame regardless of the focal length. After some time a double mirror enabled constructing an autofocus system as we know it today. 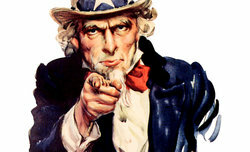 Of course there are no perfect solutions - SLR cameras have flaws as well. 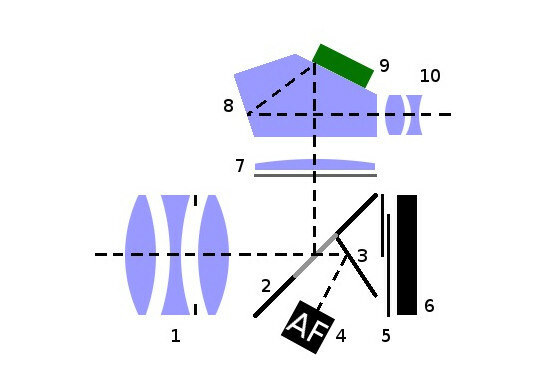 Diagram of a contemporary SLR camera: lens (1), main mirror (2), autofocus mirror (3), AF detector (4), shutter (5), sensor (6), focusing screen with field lens (7), pentaprism (8), light metering sensor (9), eyepiece (10). Firstly, it is another, quite complex mechanical system that has to perform many tasks in a split second: lift the mirror, brake it and stabilize it in its upper position, activate the shutter, wait when it closes and lower the mirror to its initial position as quick as possible. With a speed of 5 fps it all lasts no longer than 0.2 of a second. It’s worth adding here that even traditional cameras with a roll of film were able to reach much higher speeds even though drive had to wind them in the meantime. A system allowing you to complete these tasks in a very short time constitutes substantial part of a camera and influences its price in a significant way. Secondly, the vibrations related to opening the mirror can adversely affect the resolution of your image; that’s why in some models you get an option of the mirror lock-up (MLU). Thirdly, quick movements of different camera parts inside the casing cause intensive air currents which might contaminate the sensor with dirt particles. Of course dirt might invade the interior of a camera also while you change lenses. The work of the mechanism is presented in a movie, recorded with a fast camcorder (1000 fps); it is showing the mirror movements in the Praktica BX20. You can also find less dramatic examples on the Internet. The faster burst mode a camera offers the tightest control over the mirror movements must be guaranteed. Finally it’s worth noticing that the mirror has to have enough space for its movements; that requirement limits the minimum distance between the last element of a lens and the sensor and constrains engineers, designing lenses as well. Strona wygenerowana w 0.054 sek.